Look at the size of that artichoke hearts jar!!! It makes the wine bottle look tiny! 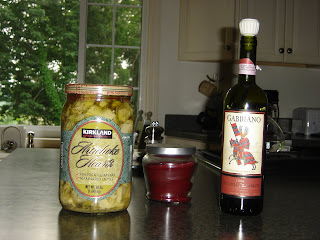 We seem to be eating lots of artichokes lately, so my parents picked up this super jar at Costco. 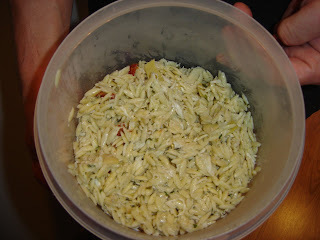 Unfortunately, when it came time to make the orzo dish, neither mom nor I could get the jar open!! Our hands didn't even fit around the lid! Thank goodness dad came home just in time! I think this recipe is from an old issue of Gourmet or Food & Wine -- I'm not sure which, and it's been a while since I subscribed to either. SP & I made this in February, before he got the OK to eat gluten, so instead of orzo he used quinoa. This time, we both ate orzo. This is one of my favorite dishes. It's very simple. Cook a pound of orzo. Buy lump crabmeat & drain it. 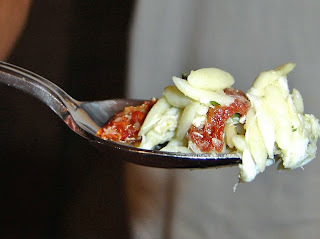 Add crab along with sun dried tomato strips, chopped artichoke hearts, and parsley to the orzo. In a blender make the dressing of white wine vinegar, olive oil, 4 artichoke heart quarters, oregano, mustard, basil, and shallots. Pour the dressing on. Season with salt & pepper. You can eat it room temperature, but we make it ahead of time and eat it cold. My parents enjoyed it as well. Even dad, who picked out the sun-dried tomatoes and artichokes!!! Last night's dessert: Rita's. The first Rita's of the year. Mom had her usual black cherry, dad tried blue raspberry, SP had a swirl of black cherry & raspberry, and I had a swirl of lemon & mango (they didn't have the coffee custard last night - that's my favorite). SP & I skip the custard in the ice, my parents like the vanilla custard in the ice. We enjoyed our Rita's while cheering the Pens to victory in Game 6. Big game this Friday night -- Go Pens!!! !